Bay Mau coconut forest village in Cam Thanh Commune is touted as one of the most-frequented tourist destinations in Hoi An City in the central province of Quang Nam thanks to a sightseeing tour that allows visitors to explore the coconut forest and gain an insight into traditional fishing techniques while riding in a bamboo basket boat. As observed by the Daily, many visitors screamed for joy when joining the boat tour to admire the stunning beauty of the coconut forest and watch local fishermen perform fishing techniques in the middle of the river to learn about daily lives of local fishermen full of hardship and challenges. Arriving the forest, the travelers will have chance to explore the wetland ecosystem. Furthermore,the visitors can also learn about the daily life of Vietnamese fishermen, their families and their community. In fact, according to statistics, nowadays, there are more than 20 households involving in this work. Nothing is more interesting than joining local fisherman on the river and enjoying hands-on experience. 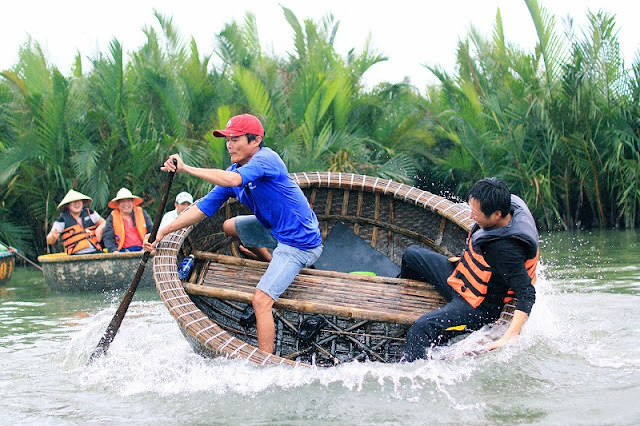 Especially, the tourists will know how to ride a basket boat. Rowing the boat through these small and beautiful channels, the tourists will come to inside of the water coconut forest. At here, the travelers can visit the coconut trees growing together and get some water coconut fruit. With the best recommend, a deluxe Hoi an tour at Bay Mau coconut forest is always the top choice for the tourists. Along with the trip to explore this land, do not forget to experience the exciting activities here.